To get the career you want, you need to be job-ready. This is your all-in-one guide to understanding what employers want and how to prepare yourself with a personal career plan. From gaining work experience, to mastering essential skills and acing the application process, The Job-Ready Guide is a complete resource for standing out from the crowd and getting a job offer. It shows you how to build a strong CV, write an impressive cover letter, excel at interviews, and cultivate the professionalism that employers want. Moving from education into the workplace can be a challenge: the world of work demands skills that you may never have had to truly use - or think about - before. The Job-Ready Guide will help you to boost your employability, covering everything you need to prepare for and start a successful career. You'll be able to conduct a systematic job search, learn how to network and develop a personal brand online, as well as hone valuable skills including leadership, teamwork, creativity and problem-solving. 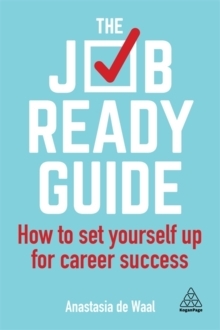 A highly practical, hands-on guide, this book is packed with useful features, including interactive exercises to help you in your real life; insider advice from employers; and tips from professionals at different stages in their careers who reveal 'what they wish they'd known'.